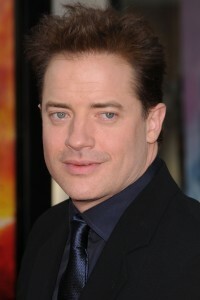 Brendan Fraser. ©Pacific Rim Photo Press/Front Row Features. HOLLYWOOD—Brendan Fraser is calling from Connecticut but he’s in a bit of a rush. You see, he’s getting ready to see a play. It’s no ordinary evening out. It’s his son’s school play, and Fraser, who has three boys altogether, is bursting with pride. “He’s the narrator,” says the star of “George of the Jungle” and “The Mummy” franchise. Fraser, 44, who has been dealing with some personal issues of late, says he plans to commit more time to being a father to Griffin, 10, Holden, 8 and Leland, 6. He divorced their mother, Afton Smith, in 2007. In the meantime, the actor has a couple new movies to promote: the animated sci-fi comedy “Escape From Planet Earth,” in which he voices an egotistical alien astronaut named Scorch Supernova, and a live action action-comedy set in Belfast, called “Stand Off” (alternately titled “Whole Lotta Sole”), in which he plays an American ex-pat, who gets caught in the middle of a botched fish market robbery and meets a young man (played by Irish actor Martin McCann) who may or may not be his son. The film, which Fraser executive produced, is written and directed by noted filmmaker Terry George (“Hotel Rwanda”). As with some of George’s previous works (“In the Name of the Father,” which he wrote and “The Shore,” which he wrote and directed), “Stand Off” touches upon “The Troubles” of the region’s past. Shot in 2011, it was Fraser’s first time in Northern Ireland, where he says he was welcomed with open arms. Q: How did you like working with Terry? Fraser: Being from Northern Ireland himself, and having lived through the troubles, this piece is personal to him. It’s masterfully handled, so far as the material goes. I can’t think of any other director for it, really. Fraser: I was approached through the normal channels. The producer came to me and asked me if I was interested in doing it. I liked the idea of a token American out of place, trying to stay one step ahead of trouble. He finds himself far removed and, in his way, going back to his roots as an Irish-American. He is in a spot of bother and needs to lay low, and finds himself in an antiques store when, who comes knocking, but a young man toting an antique machine gun and a baby in a pram. And this young man has some pretty serious demands. It’s all quite absurd but entirely plausible in its bizarre way. There are some scary gangsters who are hot on his heels. Q: Had you worked in Ireland before? Fraser: I’d been through Dublin on tour, but to shoot in Northern Ireland, no. It wasn’t as easily accessible culturally or politically then as it is today, and for some very formidable reasons, the themes of which are certainly touched upon with a leaden feather in this film. It may seem dark. If you were to tell someone this is a comedy set in Northern Ireland in an antiques store about a hostage crisis, you’re going to be quite surprised when you walk out of this film with a smile on your face. Q: It becomes an intimate family film, doesn’t it? Fraser: Yes. Thematically, so much of the material will be understood best by those who live in the UK, who are familiar with the inferences and the subject matter. That aside, it is a family drama. Like all things in life that are dark, sticky and awkward, they are best handled with a sense of humor. Q: Has it opened in the UK? Fraser: I know it was at the Belfast Film Festival and opened to an incredible reception. It filled up the hall. There were 2,000 people. Everyone and their grandma and dog came to that, and from both sides of the aisle in Irish politics. Everyone came out to support it. In my microscopic tenure as an actor creating parts, this is very special to me to have had been a part of that. It was quite rewarding. It’s nice to see everyone set aside their differences and sit down and enjoy a comedy. Q: It’s not one of your broader comedies. You get to exercise your dramatic chops in a way as your character tries to figure out if this young man who has burst into your antiques shop is your son. Fraser: Yeah. And does it matter whether or not he is because I would do this for him anyway. I would do this for him anyway. Maybe I must do this because it’s the right thing to do. And (my character) hasn’t done the right thing all the time and now’s my chance to step up and finally do it. The patronage of whether he is or not is not important. It’s the fact that he chooses to help this young man, to make him safe, to do right, is his redemption. I was moved by that. Fraser: On my mom’s side, yeah. It’s traced back to the Divine family through Pennsylvania. Q: Did you meet some long lost relatives in Belfast? Fraser: Sure. When you’re in Ireland, the first thing that happens when you walk into any pub, they’re going to want to know who you are. It’s left over from the days of “Who are you? Are you one of us or one of them?” You’d be surprised on how much you end up spilling the beans on stuff you haven’t thought about in a long time. Guinness is that potent. And they are that curious about drawing out stories from you. They love stories. Culturally, that’s so important. I love that about Ireland. Q: And you’re the executive producer of the film? Fraser: I can’t believe I get to wear that stripe. Well, I can believe it but it was helpful because it brought attention and confidence from other producers, investors and other entities and other aspects of getting the film made. It gave me access to a world-class filmmaker that is Terry George. What I learned was you’ve got to love what you’re doing. You’ve got to put good work out there. What else can you do? We try to, at least. That’s the reason to do it. Q: You also provide the voice of Scorch Supernova in “Escape From Planet Earth.” What was that experience like for you? Q: Did they like it? Q: Did they recognize you as the voice of Scorch? Fraser: I never really interviewed them about that. I never questioned them about it. If anything, it’s just part of their world. They’re little kids. I don’t know what they feel. I’ve got to jet soon because one of them is in a school play. He’s the narrator. It’s a recital about Valentine’s Day. It has to do with candy. Fraser: Was it Mark Twain that said, “When you try to predict the future, it’s hard?” I can tell you in the can is a film called “Gimme Shelter,” and one called “Split Decision” when we shot it. I don’t know what else. I’ve got them in more or less dry dock waiting for them to come out. I’ll take a bit of time to spend with my family and enjoy the quality of life.